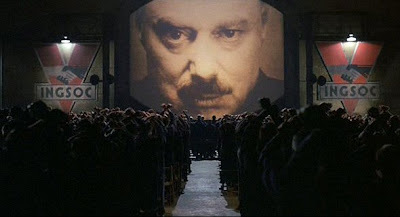 It may now be 2007, but George Orwell’s 1948 novel 1984 – which predicted a dark dystopian future in which a totalitarian government watches its subjects relentlessly - is still terrifyingly prescient. Its influence can be seen in many movies, from Brazil to this year’s V For Vendetta, while Michael Radford directed a screen version in, wait for it, 1984. But if Tim Robbins has his way, there’ll soon be a brand-new movie version coming our way. Robbins is currently directing a stage version of the novel for his LA theatre troupe, The Actors’ Gang. That runs until April 8, but when we spoke to him yesterday, he told us that he doesn’t want the 1984 experience to end there. Say the name 1984 to anybody and chances are they’ll think of three things: Big Brother, Room 101 and a third concept that hasn’t yet been made into a crappy TV show (although that’s surely only a matter of time), The Thought Police, who monitor the thoughts of potential subversives in the population. And in a world where CCTV and internet spyware means that 24-hour surveillance is more than possible, and where civil liberties are infringed by governments almost on a daily basis, 1984 seems more relevant than ever. But that’s not necessarily what interests Robbins. “In the book, Big Brother says we’re not really concerned about 85% of the people because they’re so stupefied by poverty and overwork that they’re never going to be part of the problem,” he added. “What they’re really worried about is the other 15%. So Big Brother does know!